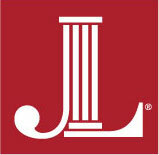 Thank you for your interest in joining the Junior League of Birmingham! 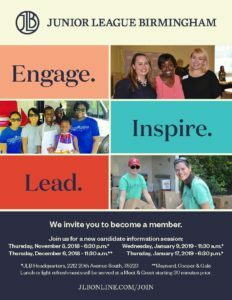 The Junior League of Birmingham has been promoting voluntarism, developing the potential of women, and improving the community since 1922. Thursday, November 8, 2018 – 6:30 p.m.
Wednesday, January 9, 2019 – 11:30 a.m.
Thursday, January 17, 2019 – 6:30 p.m. Please note: Lunch or light refreshments will be served starting 30 minutes prior to each session. Applications for the 2019-2020 Provisional Class have closed. If you would like to receive information concerning dates, materials and deadlines for the 2020-2021 Provisional Class, please sign-up here. Please find additional information in the JLB Admissions Frequently Asked Questions (FAQs). If you have any questions, feel free to directly email Kathryn Bushby, 2018-2019 Admissions Chair. *Please contact Amber Richie, Membership and Administrative coordinator, concerning transferring your membership to the JLB.